Nästa fredag 21/7 2012 "hemvänder" Barry och Pauline Erickson till Värmland. Good Afternoon Everyone and Welcome. Today is a day of celebration. This is a light hearted story based on fact and what we imagine happened 150 years ago. It is over two years since I became motivated by the unexpected death of my late sister, to rediscover our Scandinavian roots. The need for restoration of our New Zealand settler family graves was also a factor because undertaking this work to an appropriate standard required the same cautious research. My personal attention then was to establish an enduring relationship with living Swedish and Norwegian relatives. Please if you will cast your minds back 150 years and imagine half a world away what a fledging Pacific Island nation called Aotearoa New Zealand might be like. It had a subtropical moist climate, primeval jungle like forests, active volcanoes, rugged mountains, the worlds deepest fjords and lakes, and a war like native people who had discovered it only 500years before the coming of Pakeha. Towns grew wherever there were natural harbours but the physical nature of New Zealand’s interior was daunting. Maori wars were ongoing because the provinces to the north and south in the North Island were isolated by seventy miles of primeval jungle. This obstacle became notoriously known as The Seventy Mile Bush. Half a world away in the Swedish Parish of Ostervallskog, Ingeborg and Erik Person had each lost their former spouses and several children to disease associated with over crowding and famine. There was no hope of them ever owning good land that they could farm for themselves and be financially independent. Erik Persson and Ingeborg Persdotter formed a new family. Some of Ingeborg’s oldest surviving children from her first marriage to my Gr. Gr. Grandfather Erik Bryntesson, moved to Norway. One night in May 1872 Erik Persson held a family meeting which included his brother in law Anders Ericsson Fager, to discus the future of their collective family. At the time few Swedish crofters knew what lay beyond their farm gates, but Anders was a soldier, had visited America and Erik had for a while lived in Norway. We can imagine they sold their household possessions, and on May 23rd 1872, with a borrowed horse and cart carrying Ingeborg and her infant children, the blended family began their journey over the Norwegian border to Christiania. The city and port of Oslo were teaming with hopeful emigrants. Ingeborg’s 16 year old son Petrus Eriksson my Great Grandfather marvelled at the steam locomotives. And roads that were wide enough for even four carts abreast. His step sister Christina Person gazed in shop windows as she skipped along paved foot paths. She told her infant half siblings “such things could also be found in America”. The men were anxious to be cleared by the Norwegian Police, Emigration Officials and ticket agents. But at each place the news was bad. Uncertainty had gripped America following the civil war and reports of emigrants returning distraught and penniless were becoming too commonplace. Having committed everything to a new life in a new land, the stranded Östervallskog family was desperate for a solution. The horse and cart had long ago returned home. When they gave up their jobs and cottages they really had “burnt their bridges”. Tied to the wharf at the end of the street laid the SS Høvding. A modern merchant frigate receiving emigrants for New Zealand. A notice of requirements called for families of three children, single men and women. As they approached they heard their mother tongue being spoken by a well dressed official. Swedish born Bror Friberg was in Christiania assisting the New Zealand Government canvas for 5000 Scandinavian Emigrants. He told Erik Persson and Anders Fager that they were in luck. There were spare berths and that he personally would be returning to New Zealand on the Høvding, and assisting with the establishment of the settlements in the Seventy Mile Bush. Christina had been eves dropping. “I heard what the gentleman told Father and Uncle Anders. He said we “could have land for free if we could cut Seventy Mile bushes!”. Ingeborg’s 17 year old son Gustaf Eriksson was the first to board Høvding and was shown to the single men’s quarters. Anders Fager and wife Karin boarded with Petrus 16 and Christine 14 as a separate family. Erik Persson, carrying Ingeborg’s dismantled spinning wheel followed, with Edvard 6 and Augusta 2. Ingeborg carried 2 month old Alfred in her arms. My Gr. Grandfather Petrus Eriksson was indignant being classified as a child and looked on with indifference as Norwegian families gathered at the foot of the gangway to embark, or say their farvells to family and friends. He noticed an 11 year old girl looking at him from the wharf, in a manner that he was unaccustomed to. Her Hansen-Bølstad cousins were now aboard and were waving to her. Later that 30th May 1872, As Captain Berg nudged his sailing ship into Oslo Fjord, Josephine the blond Norwegian girl waved to Petrus Eriksson and her Hansen cousins one last time. Josephine Hansen would follow Petrus next year on Høvding’s second voyage to New Zealand. 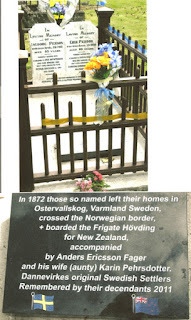 The voyages of the Høvding are well documented and the tribulations faced by the Scandinavian emigrants on their arrival are best left to Rob MacDonald’s Dannevirke the Early Years. What was the destiny of this Swedish family? When they arrived in the Seventy Mile Bush there was only primitive ex army barracks for shelter. The men were advised to make shelter for their families that were to shortly follow. They were given credit to buy provisions and government work was promised building roads several days each week. Conditions were very bad , measles and consumption had followed them ashore and was no doctor within forty kms even if he could be contacted over non existent roads. Slowly things improved. A cow was purchased which saved the lives of many of the children. Vegetables were grown and slowly the land was cleared. First the larger trees were fallen and the undergrowth allowed to dry out. With the right conditions the huge mass of vegetation could be burnt, under controlled , the ash providing fertility for pasture. On more than one occaision however, devastating fires raged out of control destroying fences homes churches and business’. Settlers lost everything they possessed. In the meantime the government was pressing for payment for their passage and land they had purchased by ballot. Erik Persson drew town block 8 which included Gordon Street where coincidentally my late sister Glenys and I grew up. The land was relatively poor there. From time to time the government breached its promise of work, by stopping the road and railway development which was the only source of income for many Scandinavian families. When this happened the penniless settlers became more heavily in debt to the storekeepers. Having lost hope of the railway ever reaching Dannevirke, Erik Person sold his land to the storekeeper. Erik was still a charcoal burner at age 71 living in a whare Maori hut at a sawmill situated near Dannevirke. He required a translator when he gave evidence in court. He and Ingeborg after naturalisation anglicised their surname to Pearson. We cannot find trace of their oldest child Edvard Pearson. But I can trace Augusta Pearson to Ormondville. Edvard and Augusta Pearson’s parent’s death certificates indicated these two children had both died before their parents. Two month old Alfred Pearson became a bridge builder. We have letters with us from Alfred’s grandchildren. Anders Ericsson Fager; was his soldier’s name that he was entitled to keep. Anders and Karin drew block 20 behind the Dannevirke railway station. Anecdotally he was lost in the bush. I am not satisfied that was Anders Fager’s fate. I can find no record that supports that theory or, whatever happened to his wife Karin. Petrus Eriksson, my Gr. Grandfather, was too young to draw a block of land. Eight years later he married the blond Norwegian girl who waved to him from the wharf in Oslo. They had ten children. All seven sons were fit to serve in WW1 but only two of them produced sons. Locating our Swedish relatives followed a “payment or two” to the Swedish Genealogy Society and then a sterling effort of one particular researcher and new friend Olle Andersson who physically located family members still living within relatively short distance from a place they have identified as where our NZ Settler family once lived. The Osterwald family embraced us enthusiastically and we were soon Skyping with them on a regular basis. During my Swedish research journey I was deeply moved by the deprivation, grief and sorrow that visited our Swedish family. Equally I have been impressed at their resourcefulness and generosity of spirit particularly during the settlement of Dannevirke. That same generosity of spirit is present here today. The warmth and kindness and generosity extended to Pauline and me is overwhelming. Above all I have been uplifted by the pride I have in my Nordic forebears who contributed to the fabric of our past and smoothed the way for those of us who followed. “Then there are the Scandinavians, without peer the finest recruits that a British colony ever could secure from a foreign land. By their coercion perseverance and industry they have actually exerted an influence on the national character”. The Early Years were tough. Within a short time those that could, moved on to greener pastures, soon only ten families of the originals remained. Our forbears sensed that to survive, be accepted into an already egalitarian society they should dress, speak and conduct themselves, like New Zealanders. Very quickly Nordic customs, language, dress and Lutheran allegiance modified or vanished. Although I grew up in Dannevirke, until just a few days ago I had never heard any Nordic language spoken in a conversation, in my life time. May I conclude by saying… On behalf of our New Zealand Swedish Settlers descendants “thank you, for your community’s generosity and kindness re establishing a cherished relationship between our families and community. It has been a fitting memorial to our common family from Ostervallskog Sweden; who crossed the boarder into Norway possibly bound for America, made their way onto a sailing ship bound for a land they possibly had never heard of when they said good bye to the remnants of their family in Sweden. This voyage has changed our lives forever. Although we live in a secular society, Pauline and I acknowledge our Christian faith. Our Swedish Settlers family would not have thrived without strong family relationships, based on Christian values, tolerance and kindness to one another. That same Christian spirit of values and kindness that I saw in my parents and grandparents I see also here, among you today. 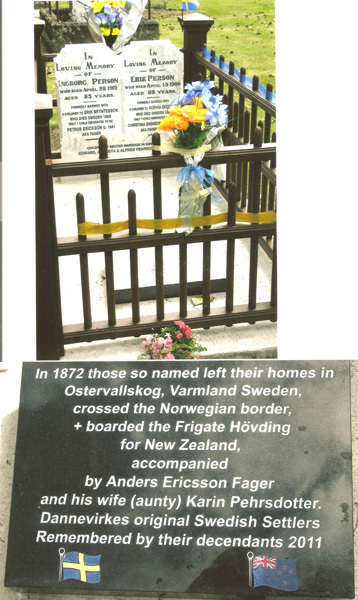 They made a worthy contribution to the development and defence of News Zealand whose name they had possibly never heard of when they said goodbye, to the remnants of their family in Östervallskog. I hope you enjoyed hearing their story. The blended Bryntesson/Eriksson and Persson/Pearson families experienced every imaginable emotion during their struggle to establish a life in the Seventy Mile Bush. Our research has also revealed that other living family members, Juliusson and Eklöf, are related via Erik Bryntesson, father of Petrus Erickson. Pauline and I will be staying with the Österwald’s and meeting wider family in late July. TIFF >>JPEG2000 as archive format?